RMS Luxury Wet Tables have been designed for the day spa that desires to offer wet room treatments with affusion / Vichy shower massage, relaxation treatments, mud, seaweed envelopments, scrubs and similar applications. Special self-drain height adjustable wet massage tables for hydrotherapy treatments with comfortable water proof mattresses and headrests, etc. are successfully used for multiple spa treatments such as Affusion / Vichy shower, massage, peeling, envelopment, exfoliation, etc. Molded anatomically shaped table is designed for maximum comfort and relaxation. It limits water splash due to special design and self-drain base. 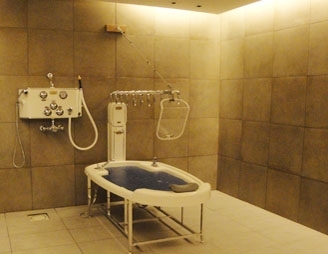 RMS hydrotherapy equipment is designed with an eye for detail and attention to comfort, scale and quality and is always highly reliable and user-friendly. Wet table model A equipped with drain, self-leveling feet, special easy-to-clean vinyl mattress (pad) and head pillow. Model B also includes automatic water mixing system /thermixer and hand shower with individual shut-off valve. Adjustable height makes RMS wet tables comfortable for any therapist and customer.